After being hungry at a beer event, J suggested we go grab some tacos at Cuchillo. 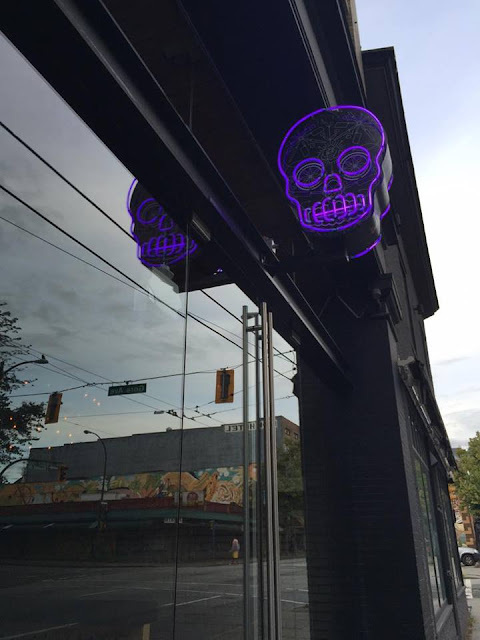 I didn’t know this place existed and it is quite a hidden gem with only a skull on the outside of the restaurant! We started off with some white wine and rose. I can’t remember the names of these but that they were rather fruity. Our first taco was the Baja Style Battered Rockfish. The beautiful green coloured kale and hemp corn tortilla was topped with jicama slaw, chipotle aioli, and of course the battered rockfish. This had a good spicy kick but man this was good! The batter was light and the fish remained moist. Their tacos are quite packed for the amount of tortilla you get so it can be quite messy to eat! The second taco we had was the Pulled Duck Y Cracklin’ which came with roasted garlic, blackberry habanero jam, pulled pork, crackling, and this all sat on top of a black bean corn tortilla. I really enjoyed the sweetness of the blackberry jam against the tender pulled pork. We also tried one of their larger dishes, which was the Pork Belly Confit which came with a maple chipotle and tamarind glze, a granny smith puree and was topped with chicharon and patacones (or fried plantains). The ratio of fat to meat was right on and the meat was tender! So much fatty goodness. This is definitely a great spot to grab some tacos and enjoy Mexican food. I like how the place feels more upscale yet it’s casual enough so you don’t need to dress up. If you’re feeling a little fancy but want tacos, then here’s the place to go. Great for a girls night out or date night.